Jacobins and Utopians examines the politics of ideal societies and the means necessary to bring them into existence. George Klosko reveals how discussions of fundamental moral reform lead inexorably to questions of political power. Machiavelli classically articulated the claim that unarmed prophets go to the gallows. Themes of revolution play an integral role in Klosko's study―as the figures he explores frequently concerned themselves with the means of becoming armed. Klosko focuses particularly on what he calls "educational realism" as a means of channeling political power in pursuit of moral reform. If people are to become fit for an ideal society they must be subjected to intensive education, which in turn requires control of the educational environment and, consequently, of society as a whole. Klosko identifies Plato as an educational realist and contends that Plato, contrary to his reputation as a pure utopian, actually provides a searching analysis of the role of political power in fundamental moral reform. 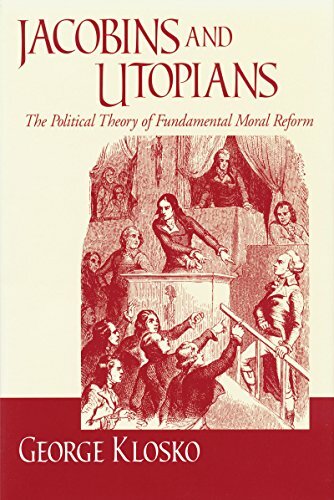 In addition to Plato, Jacobins and Utopians canvasses strategies of moral reform proposed by Plutarch's Lycurgus, Socrates, Thomas More, Machiavelli, Robespierre, Saint-Just, Bakunin, Charles Fourier, Marx, and Lenin. Klosko analyzes both the advantages of Jacobinism as a political strategy and its inherent flaws.